Is this test still valid? Over the years, free market capitalism allowed the rise of specific test publishers who catered to the needs of the public schools, creating the various tests to reflect the basic skills being taught, administering the tests to a variety of social, economic, cultural and ethnic groups throughout the country, compiling the results of those group testings in what is called a "normative" or "norm-referenced" statistical analysis that can be empirically documented, and then selling those tests back to the schools and/or general public at a profit. You can imagine that since producing such a test is quite an expensive undertaking, the publishers of all nationally standardized achievement tests only revise their tests about every five(5) to ten(10) years or so. The previous tests do not stop being valid; they are just superceded by a new "norming" or comparison group. Sometimes test publishers simply statistically "recalibrate" the score results based on the most recent US Census; other times the test publishers create an entire brand new book. This is what has happened with the CAT/5®. Originally called the California Achievement Test when it first appeared in the 1950's, the CAT has actually undergone six(6) revisions, and even a name change to now being called "TerraNova." During the design phase of each edition, the norms are again established by administering the test to a large, representative sample of the US school age population (in the case of the CAT, over 30,000 students). Then the new tests are distributed and promoted as "newer" and "more up to date" versions of the test. Of course, the new tests are often only "newer" in the fact that they may reflect what is being currently taught in the public schools at the time of the new version, or have more modern language, photos, graphic design, advertising, etc. But the previous tests are every bit as valid a testing instrument today as they were when they were first created. And many schools (both public, private and homeschool all over the USA) continue to use the older versions of the test quite successfully. However, having said all this, it should also be noted that homeschools and private traditional-classroom schools do not always have access to those newer editions, which, because of economic and contractual reasons, are usually reserved for the larger public schools/systems. For several years, the CAT/5 was the only version/edition of the California Achievement Tests that the publisher (CTB/McGraw-Hill) allowed private schools and homeschools to use. In fact, all the major tests and their publishers (including ITBS, Stanford, MET, WJ3, etc.) restrict homeschools and private schools to the older editions of their tests. Only public schools under contract with those publishers have access to the newer versions. Private schools and homeschools are now allowed to use the CAT/6® (also called the "TerraNova"), but there were other issues with this change that are addressed in the next paragraph. It should again be emphasized, all of this change does not make the older editions any less valid than the newer ones. Newer editions simply compare your students' test scores to a more recent national sampling of children whose academic progress is statistically represented by those national norms. But that does not mean that the older editions cannot be used or do not have any value. All nationally standardized achievement tests, no matter what edition or what year's norms are used, will give you the kind of scores and comparative data (e.g. Stanines, Grade Equivalents, Percentile Rankings, etc.) you need to show how your students are progressing in their academic subjects. And scores from any of these older editions will still satisfy the laws of most states regarding annual achievement testing for private school and homeschooled children. Frankly, my research has found that there are no major differences between the newer and older editions of the tests. All editions have the same fill-in-the-bubble, multiple-choice workbook format & similar questions asked in all the same subjects; they all have approximately the same working times; they all have the same purpose and approach and measure the basic academic skills gained over time; and they all give the same kinds of data and scores on the reports. This is simply the nature of standardized achievement tests. The minor differences that do exist between editions would be found in layout, more contemporary graphic design, and content that is reflective of what is being taught in the public schools (e.g. newer editions have more "multi-cultural sensitivity" and teach less about US Constitutional government and history than the older ones). Other than these minor differences, there just isn't much major change from edition to edition. Given the type of product and the purpose for these nationally standardized achievement tests, there just isn't a whole lot to change or improve from year to year. All of this is why we can still offer the CAT/5 at a reasonable price and in an easy-to-order service to homeschoolers and private traditional classroom schools all over the nation. Many public and private schools still use these older editions, and homeschoolers across the USA still use these older editions. The vast majority of states have laws that allow any edition of these tests to be used to satisfy state testing requirements. Therefore, you should have every confidence that these older editions will serve you well. Though others may question your use of these older editions, anyone who understands the nature of achievement tests and the various factors involved, as I have explained them above, will realize that neither the academic well-being of your students nor the satisfaction of state testing laws will be negatively affected by using an older edition. There is one section on the CAT/5® with what most would consider "outdated material". The Study Skills subtest (only for grades 4-12) asks the student to answer questions using the "card catalog"; these and some of the other conventions listed there are outdated since the invention and wide use of computers. However, the answers can be easily determined by analysis of the diagram included on the test. Besides, this section is "optional," and, since it is not required by most state laws regarding achievement testing, you do not have to complete it. Leaving it out will not affect your student's overall score in any way, nor will it negatively impact or invalidate the test for purposes of satisfying state laws regarding achievement testing. I thought the CAT/5® had been discontinued? The answer to this question is both "Yes" and "No"! First, yes, the test's publisher (CTB/McGraw Hill) has stopped printing and servicing the CAT/5. It is no longer available for purchase from CTB directly. However, "No" that does not mean that the CAT/5 is no longer available. The CAT/5 is no longer printed or serviced by the publisher which has also withdrawn permission for us to reprint or sell the test books for you to keep. Therefore, if you choose to use the CAT/5, you should understand that these slightly used test materials are being loaned/rented to you by Piedmont Education Services for the purpose of the test administration and must be returned to us along with your student(s) answer sheet(s) in order to obtain a score report. Since we cannot sell you the actual test books, you understand that you are purchasing a scoring service. Test booklets returned late and/or damaged, beyond normal wear and tear, will incur additional costs. Your care of the materials and prompt returning them to us will enable us to continue to provide this service to others. We believe so strongly in the quality and validity of this time-honored testing product, that we are happy to offer it again this year. Why do you continue to use this older edition of the test? 1.) show the student's relative strengths and weaknesses when compared to others of his age/grade. We have chosen to continue to use this older edition because we believe the newer editions often reflect lower standards of education and testing in contemporary government schools. It is widely acknowledged that our nation's academic standards are, by and large, not improving. Some experienced public school teachers have even accused the system of deliberately "dumbing down" the students over the years, and that basic skills are not being taught, as they once were, in a majority of the nation's conventional classrooms. (Even a brief web search for articles about the decline of standards and educational quality in America's textbooks, will be quite revealing and shocking.) We believe that this overall academic decline is reflected in some of the newer versions of the various achievement tests (e.g. newer editions of the many standardized tests omit spelling, grammar and/or punctuation & capitalization as separate subtests). The older achievement tests are not tied to the so-called "Common Core" being promoted by the Federal government, and they seem to us to have a much higher academic standard that is in line with what parents and teachers (especially in homeschools and traditional classroom private schools) want and teach. Newer editions of modern secular textbooks, and by extension, the possibility of newer nationally standardized achievement tests, also seem to reflect a greater bias in favor of atheistic evolution, immoral humanism, and unchallenged multi-culturalism, and against traditional Judeo-Christian values as expressed in the Bible, the teaching of American history in favor of social studies and behavior, and the lack of specifics concentrating on Spelling, Grammar, and other traditional skills. It is our opinion that it is neither necessary nor entirely desirable to reflect "modern curriculum trends" in our education processes or achievement tests. Therefore, we continue to offer the CAT/5® to families who share our viewpoint. Even though the publisher has discontinued printing and marketing the CAT/5® (and its older predecessors) on a large scale, we are making these used test materials available on a loan/rental basis, at an excellent price. The basic skills required for a functionally literate education have not changed. The CAT/5® still accurately measures a child's basic skill development in the time-honored subjects of Vocabulary, Reading Comprehension, Spelling, English Grammar and Composition (including Punctuation and Capitalization), Math Computation, Math Concepts and Application, Science and Social Studies/History. State laws and regulatory agencies that require testing to indicate satisfactory progress in the basic subjects and skills can be adequately fulfilled using the CAT/5®. You can be confident that the CAT/5® is an effective means to the end of better academic instruction for your students. Can I administer the CAT/5® to my own children/students? Yes! Since there is no advanced degree required to administer the CAT/5 tests, homeschooling parents/teachers without a bachelors' or masters' degree can administer the test themselves to their own students in their own home without all the hassle and expense of arranging for and driving to a separate testing situation or getting someone else to administer it for you. Instead, you can administer it yourself to your own children in their own learning environment at home! What requirements are there for me to use these tests? 1. Maintain the security of testing materials before and after the testing. 3. Under no circumstances photocopy or otherwise reproduce the testing materials. 4. Administer and interpret tests exactly as specified in the manual. 5. Avoid labeling students based on a single test score. 6. Comply fully with all applicable laws in my state regarding achievement testing. 7. Return all test materials to Piedmont Education Services within 2 weeks of test date. You must also abide by your state's laws regarding achievement testing. Here in North Carolina, the homeschool/private school law states that "Each qualified non-public school shall administer...at least once in each school year...a nationally standardized test or other nationally standardized equivalent measurement selected by the chief administrative officer... "
You can see then for the state of North Carolina (and similarly in other states as well), when simply stated, that in the matter of the achievement test, you have perfect liberty both to choose the kind of test your child takes, and to determine the time, place and setting in which the test is given. You may also choose who gives the achievement test to your child. And while the North Carolina Dept. of Non-Public Education (the government regulatory agency responsible for oversight of home schools and all other private traditional classroom schools in the state) recommends that a third party administer the test, NC law makes no such requirement. It is also helpful to remember that (again according to NC state law), if you are home schooling, your school is legally considered a non-public or private school. As such, you, the parent-teacher-administrator of your own private school, have all the privileges of controlling every aspect of your children's education. If you are ordering from anywhere outside of North Carolina, please be sure to follow your own state's laws regarding the administration of achievement tests. You may wish to contact your state's authorities for oversight of home schools for more information. How does the CAT/5 compare to other types of nationally standardized achievement tests? Since all the different tests are made by different companies, you will have some subtle differences. Frankly, however, I have not seen a major difference in any of the tests. Some researchers say that the ITBS and the Stanford stress more reasoning skills; but after evaluating both the CAT/5, the TerraNova and the ITBS, I haven't seen that to be a major factor. All tests measure both memory recall and reasoning (co-called "higher order" thinking skills). Some questions may stress this more than others, but all tests have both kinds of questions. This is the nature of the achievement test. Most nationally standardized achievement tests (TerraNova, ITBS, CAT, Stanford, MET) are similar in that they use a multiple choice, fill-in-the-bubble, workbook format, national norms, scores broken down into various types (Grade Equivalents, Percentile Rankings, Stanines) based on national norms (i.e. comparisons to other children having taken the test across the USA). Subjects tested, time frames for completing the tests, and the exact number of questions will vary somewhat. The layout will usually be somewhat different, and newer versions/editions of the tests will often have newer pictures and photos. The biggest difference in the test questions is that most of the newer versions of all of the tests have more "multiculturalism" ("the acceptance or promotion of multiple ethnic cultures, for practical reasons and/or for the sake of diversity and applied to the demographic make-up of a specific place, usually at the organizational level, e.g. schools, businesses, neighborhoods, cities or nations. In this context, multiculturalists advocate extending equitable status to distinct ethnic and religious groups without promoting any specific ethnic, religious, and/or cultural community values as central." http://en.wikipedia.org/wiki/Multiculturalism). This is especially true in Social Studies which, as a general rule in the public schools, teaches about subjects like Kwanzaa, the exploitation of native Americans by Europeans, etc., and/or other possible questions reflecting more contemporary values/ideas and/or political correctness. The ITBS, Form A, has more of this than the CAT/5. However, all nationally standardized achievement tests have this to some degree or other. All tests produce excellent score reports which have different data for comparing your child(ren) to others across the country. As for who can administer the test, while most test publishers allow homeschooling parents to administer the test to their own children, some testing companies have various stricter policies in place. However, only the CAT/5, the TerraNova/CTBS, and the PASS test do not require a bachelor's degree or other advanced degree to administer. All-in-all, selecting which achievement test to use is like choosing a car to drive. All tests have slightly different "bells and whistles" or minor features, but all do the same basic job of getting you where you need to go. truthfully, any of the nationally standardized achievement tests will accomplish the task of evaluating your child(ren)'s academic progress from year to year and/or satisfying your state's legal requirement for testing. Therefore, your decision as to which test to use may rest on something as simple as personal preference, the price of the test/service, and/or the quality of service and information you get from the test provider. We hope we excel in these areas and that you will allow us to serve you and your testing needs. When are the CAT/5 tests available? We offer testing year round. You may order the test any time and for administration at any time. Computer-generated score reports and explanations/phone consultations are available year-round. Is there a deadline for ordering? Unless your state has specific stipulations, there is no deadline per se. The tests can be ordered any time during the year. The ordering page has a pull-down menu for you to choose your testing week. However, during the busy Spring testing season (approximately February 15-June 30), we ask that you allow at least 1 week processing time, if possible. We would like to have your order about a month in advance of your testing week so that we can make sure we have enough booklets, etc., and can mail your materials to you in time for your scheduled test administration. How do I choose the correct test level? Normally, you would the select the grade level that your student is just completing. However, if you know your student is not performing up to grade level, you can test "out of level" by dropping back a grade. For students in so-called "gifted" or "advanced placement", or who may want to move ahead in the graded organization of school subjects, you may also test "out of level" by using a test book from a higher grade. Keep in mind that every test has overlapping test sections. For instance, the 4th grade test has some 3rd grade questions, some 4th grade, and some 5th grade questions in each subject area. The scores will reflect their grade equivalent (i.e. being compared to others in that particular grade) so you will still be able to tell where the student is performing academically. When will I receive my tests? You will usually receive your test materials sometime the week before the scheduled "Preferred Testing Week" you selected on your order form. The price includes shipping to you (our instruction sheets, the Examiner's Manual, Student Book and Answer Sheet appropriate for your student's grade level). All test packages are shipped by USPS First Class or Priority Mail, which includes tracking and insurance. If you require Express or Overnight, or an alternative carrier, you will be asked to pay the additional charges (please call for price and availability). Is there a refund given if I am not able to use my test? Yes, refunds are possible, but we will deduct the cost of shipping, plus a 20% restocking fee/credit card processing fee if applicable. Materials returned must be in good condition for resale. Credit toward future purchases of any of our product and services may also be given in lieu of a refund. Each situation will be evaluated on its own merit. Please make every reasonable effort to determine that this is the test you need as well as to schedule the testing in advance with plenty of time to spare to meet reporting deadlines, government mandates, etc. Since all testing materials remain the property of Piedmont Education Services, you will be held responsible for any lost or damaged testing materials. Please be aware: an additional fee of $30 will be charged if all testing materials are not returned to us within 14 days of your scheduled testing week. Piedmont Education Services reserves the right to deny service or cancel orders from any customer at any time. Thank you for understanding. What should I do before I begin administering the tests? 2. Plan your testing time. PLEASE NOTE: Grades 1-3 must be tested separately since they have different times allowed to work each subject. In these early grades, some items are read aloud by the examiner and have approximate working times. Precise timing is not expected unless specified in the directions. All items should be read at a moderate steady pace. Grades 4-12 can be tested together since they all have the same working time frames. In Grades 4-12, exact timing is expected (unless your student has special needs and you are doing what is called a "non-standard administration" of the test). In all grade levels, it is permissible to change the order in which the subtests are administered. Testing can be completed in 2 or 3 mornings (from approximately 9:00 AM - 12:00 noon). However, if it would better fit your needs, you may spread out the testing schedule to administer just one or two subtests per day. 3. Please DO NOT write in any of the Examiner's Manuals or Student test books. Use the Answer Sheet that is included for each student (blue for Grades K - 3, red for Grades 4 - 12) to have your student9s) fill in the bubble for the correct responses. Use scratch paper for math work, notes, and "doodling." An additional charge of $10 per student book or Examiner's Manual will be charged before scores are released if the books are written in or damaged in any way. Parents/teachers are responsible for their students' actions in regards to these testing materials. 4. PLEASE, NO FOOD OR DRINK while handling or administering the tests. The paperback test books are very easy to damage when they come in contact with food, grease and/or liquids. To avoid any additional charges, you should return all materials in as good a condition as you received them. 5. Complete the name & data grids for student's last name, first name, date of birth, gender, CAT/5 Level and Grade. All other grids are optional/not applicable. Incomplete grids could result in the forms being lost or unable to be scored! How long do I have to administer the tests? The various parts (or subtests) can be administered in a little as two morning sessions or spread out over several days; the choice is yours. It is not recommended to do everything in one day. You should follow the specific instructions in the Examiner's Manual; subtests (especially in older grades) are often timed and should not be broken up or time frames disregarded, except in the case of "non-standard" administration for students with special needs or learning challenges. However, it is allowable to separate or change the order of the test segments as is best for the student. Usually, one(1) week is sufficient to administer the tests to your student(s) and then package them up to return to us. But if you need more time, please call us at 336-924-2494 for assistance. Please be aware: an additional fee of $30 will be charged if all testing materials are not returned to us within 14 days of your scheduled testing week. What should I do if my child is sick or there are other emergencies/unavoidable problems? We ask that you plan carefully in every detail for your testing week and not make last-minute, unnecessary changes in your schedule. However, we certainly understand that illness and/or other emergencies arise from time to time, and we will allow you extra time to complete the tests. Please call us at 336-924-2494 if such emergencies/problems will keep you from finishing the tests in more than 2 or 3 days beyond your original schedule. You are responsible to return all materials to us in a timely manner. Please be aware: an additional fee of $30 will be charged if all testing materials are not returned to us within 14 days of your scheduled testing week. May I or my student(s) write in the test booklets? PLEASE DO NOT WRITE IN ANY OF THE EXAMINER'S MANUALS OR STUDENT TEST BOOKS! An answer sheet is included for each student in each grade. Grades K -3 will have a blue-on-white, 2-sided page; Grades 4 - 12 will have a red-on-white, 2-sided page. Complete instructions are included in your test package. If your student has a hard time filling in the bubble for the correct response to the questions, you may help the student by coloring in the bubble for them. Please use separate scratch paper if you wish to record your start and stop times or to make other notations. Make sure the students do not write or make extraneous marks in the testing books. An additional cost of $10 per student book or examiner's manual will be charged before test scores are released to you if the books are written in or damaged in any way. Parents/teachers are responsible for their students' actions in this regard. Students with learning challenges who need additional help with filling in bubbles on the answer sheet, etc., should be assisted by their parents or other competent person to commplete the answer choices and make appropriate mark on the answer sheet rather than circling answers in the book. PLEASE, NO FOOD OR DRINK while handling or administering the tests. The paperback test books are very easy to damage when they come in contact with food, grease and/or liquids. To avoid any additional charges, you should return all materials in as good a condition as you received them. We ask that you take care of the books, and not to write in them or damage them in any way, because we reuse the test books for other families. The only way we can continue to stay in business and offer this testing service is to reuse the books over a year's period of time, allowing multiple families to take the test, return the books to us, and then we repeat that process. In the material we send you, we state that you are not purchasing the books, but are leasing them from us for the purpose of testing. You are purchasing our service and the score reports obtained from that service. All testing materials remain the property of Piedmont Education Services. A damaged book fee of $10 per book will be charged if books are not returned in a satisfactory condition. Please remember, you are leasing/renting, not purchasing, the tests and actual booklets, etc. You are purchasing an achievement testing service and the score reports obtained from that service. All testing materials remain the property of Piedmont Education Services. Please be aware: an additional fee of $30 will be charged if all testing materials are not returned to us within 14 days of your scheduled testing week. Thank you for your help in this matter. What should I do after the test is completed? 2. If you have more than one test, sort answer sheets by grade & alphabetize them within each grade. 3. Securely package ALL materials sent to you & return them to us using the FREE PRE-PAID RETURN LABEL included in your packet. To avoid any additional charges, you should return all materials in as good a condition as you received them within 14 days from your scheduled Preferred Test Week. Please remember, you are leasing, not purchasing, the tests & actual booklets, etc. You are purchasing an achievement testing service and the student(s) score reports obtained from that service. All testing materials remain the property of Piedmont Education Services. Please be aware: an additional fee of $30 will be charged if all testing materials are not returned to us within 14 days of your scheduled testing week. What happens to my student(s)' answer documents when I return them? When you return all your testing materials to us, we check to make sure they are in good condition and then note your file accordingly. Then the answer document is scanned and a computer-generated report is created. Reports will be returned to you in a few days electronically through a pdf copy by email. A printed report sent by USPS First Class Mail is available upon request. Your achievement test reports are revealed to no one but you. We are not a government agency nor are we connected with any. We do not share any of your personal information, your student's information or any test reports with anyone without your written permission, unless required by a court of law with proper jurisdiction. We do store your contact and/or payment information as well as your student's test report from year to year in a secure data base on our company computers/hard drives/flash drives. However, these are not connected in any way to the internet and are thus not liable to be hacked or compromised in any way. Of course, we have no control over what the government or others may do in snooping or reading electronic/digital communications such as email. But we take very seriously the trust you have placed in us and do everything in our power to maintain strict control and privacy in these matters. We normally send your achievement test reports in a pdf format via email. But if you are concerned about privacy issues, then please let me know and we will communicate with you via USPS First Class Mail. The report we provide for the CAT/5®, Complete Battery, is comparable to other testing services, and includes common scores such as the Grade Equivalent, Percentile Ranking, and Stanines for each subject tested. Do scores on the CAT/5® reflect a student's understanding or use of a particular curriculum? No. There isn't any specific curriculum attached to or associated with the CAT/5® (nor, for that matter, any other brand of nationally standardized achievement test). Rather, the subjects and skills measured by the tests seek to reflect those commonly taught in traditional school curricula used in all types of schools - public, private and homeschool - in the USA. The score reports will, therefore, give academic achievement data that compares the students to the normative group, i.e. their grade peers across the country in these various types of schools who originally took the test to form the norm group. This is why these are called "Nationally Standardized (or normed)" achievement tests. Why do we use this older edition of the test? Please see the answer in #3 above. Is there anyone who can help me understand my test reports? Yes, individual personalized evaluations and academic consultations are available year round by our experienced staff, by phone or email. For only $10 extra per student, you may choose to receive a brief consultation to review and discuss your students' test scores and any curriculum suggestions, learning styles, etc. This is very similar to what we have done for the past 15 years with personalized test administration, with the exception that instead of driving to various cities and locations to meet with you personally, we will now speak with you privately by phone after you have administered the achievement tests to your students and you have received the computer-generated score reports from us. If you would like this helpful option, please be sure to complete the appropriate box on the order form, or call Greg at 336-924-2494. We look forward to serving you! What types of scores will I see on my scored reports and what do they mean? The publishers of all nationally standardized achievement tests make a wide range of scoring types and data, with little difference in the way the data is derived, since they all are administered and scored in the exact same way. However, not every scoring type is available to everyone for two reasons: 1.) the expense involved, and 2.) the needs of the customers and/or what the test provider thinks is important. Test publishers do not usually deal with individual parents/teachers or small schools, but often grant distribution agreements to testing companies, like Piedmont Education Services, who purchase the tests in bulk and and provide scoring services according to a pre-arranged contract with the publisher. When providing the scoring services, these testing companies must choose, usually from a smorgasbord of scoring options offered by the publisher, those types of scores and reports that they think will a.) best meet the needs of their customers (from very basic numbers to more complex reports) and b.) still keep their company competitive with other testing companies across the nation. Thus, both the needs of the customer and the expense required to provide the service play big factors in what types of scores will be on any given report. Therefore, for 2011-2012, because the vast majority of our customers want and/or need the basic set of traditional scores of National Stanines, Grade Equivalents and National Percentile Rankings, our score reports will include these three data points for each of the subtests administered, plus a graph that pictorially presents the scores in comparison with the student's age/grade peers in the norming group. Because of our amended contract with the publisher and their discontinuation of certain scoring features, the Objectives Performance Scores that were provided in previous years are not available in 2011-2012. Instead, we have created more detailed explanation pages that will be sent along with the test score reports. Listed below are the names and explanations of the terms/scores you will see on the CAT/5® Individual Test Record (Itr). All these terms are commonly used in most nationally standardized achievement tests. We will also provide an explanation page with your report(s) that gives complete details. However, feel free to call (336-924-2494) or email us (service@pesdirect.com) if you need additional help.
. National Stanine (NS): categorizes test performance into only nine broad units (with "1" being the lowest and "9" being the highest), that always correspond exactly to percentiles; most often used to compare large groups of students.
. Grade Equivalent (GE): an estimate of where the student is along a developmental continuum, not of where he should be placed in the graded organization of the school. It may reflect the actual level of task difficulty a student can consistently perform. Thus, if a student receives a grade equivalent of 7.8, that says that he is estimated to do, in that particular subject, what an average student in that grade (and month, assuming nine months in a traditional school calendar) would do if given the same questions. However, GE's should always be interpreted with caution. 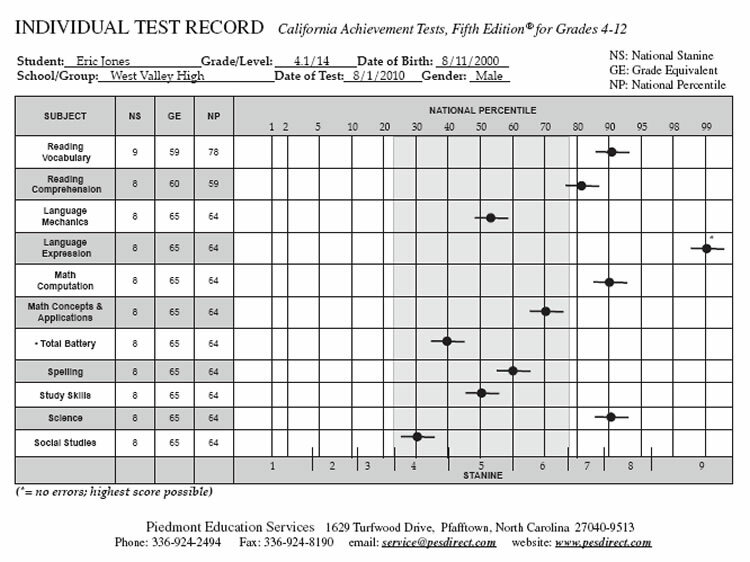 Since the GE indicates the year and month of traditional school for which a student's score is typical, the scores should not be the sole criterion for grade placement or other evaluation.
. National Percentile Ranking (NP): describes the student's performance and relative standing in the norming group. For example, a PR of 90 means that a student scored as well as or better than 90 percent of the students his age or grade level, which would put him in the top ten percent of the students who took the test. What are some general guidelines for understanding these scores and how to use them in my teaching? An achievement test is designed to help determine how much skill or knowledge students have in a certain area. . . whether students know as much as we expect they should, or whether they know particular things we regard as important. To accomplish this evaluation, test scores must be compared or referenced to something in order to bring meaning to them. That "something" is typically (a) the scores other students have obtained on the test or (b) a series of detailed descriptions that tell what students at each score point know or which skills they have successfully demonstrated. The first of these comparisons is called "norm-referenced interpreting" and involves comparing a student's scores with the scores of other students obtained on the same test. How much a student knows is determined by the student's standing or rank within the reference group. High standing is often interpreted to mean the student knows a lot or is highly skilled, and low standing is often interpreted to mean the opposite. However, it is important to use care when interpreting test scores. Remember that norms are not standards of performance. Norms (usually reported as Grade Equivalent, Percentile Ranking, Standard Score, Age Equivalent, etc.) simply report how scores are distributed in a representative sample of the population. These scores are simply statistical comparisons of the individual student to the larger group of peers. By statistical definition, one-half of the subjects at any grade or age level must be at or below that grade or age score and one-half of the subjects must be at or above that grade or age score. Therefore, you should avoid labeling or categorizing students based on a single test's scores. Careful consideration of the information will result in varying implications for different students. Test patterns will provide information about an individual's strengths and weaknesses and, in some cases, provide insights relevant to necessary accommodations or appropriate instructional recommendations. However, test performance identifies only relative strengths and weaknesses. They are relative because they are identified comparing the performance of a single student to how he relates to the group. They are not necessarily absolute strengths and weaknesses. However, testing is just one part of the total process. The teacher should compare and integrate test results with information from many sources, including firsthand observation of the student, the child's daily course work, parental reports, etc., to get a complete picture of the student's abilities and skills and subsequent application to curriculum needs and teaching methods. Because test scores are rarely without error, it is essential that parents understand that the scores need to be interpreted as a score range rather than as a precise score point. Many parents have the mistaken notion that test scores provide a comprehensive picture of how well their child has progressed in school. However, one should not use test scores as the only indicator of school achievement. The scores reported as Grade Equivalents (GE) and Percentile Ranking (PR) have the greatest potential to be misunderstood and/or misinterpreted. Grade Equivalents are usually an indicator of year-to-year growth. However, there are any number of factors that may affect a student's GE either positively or negatively. GE's are only an estimate of where the student is along a developmental continuum. They should not be valued as a precise measurement of how much the student has progressed from one grade to the next. The same can be said for Percentile Rankings. Slight changes in a student's percentile ranking over time have very little meaning. A change from the 40th percentile in one grade to the 42nd percentile in the next grade may seem to mark little progress. Or a change from 68% to 61% may be regarded as no progress or even regression. However, it is important to understand that, because of the statistical nature of the achievement test norms, students who maintain nearly the same rank in their peer group from year to year are actually progressing at a rate that is typical for that grade. It is for these reasons that neither the GE's nor the PR's should be used as sole indicators of the student's overall achievement. In short, nationally standardized achievement tests and their scores are not precise measurements, but are, rather, simple tools - among a wide array of educational items - that a wise educator may use to craft his teaching methods and curriculum and to guide his students' academic progress. © 2013 Piedmont Education Services and Site design © 2013 PES Direct Webmaster. Any use of the information and products contained herein is solely the responsibility of the user. The site is intended for educational purposes only. In accordance with Title 17 U.S.C. Section 107, links, information, and other materials on this website are distributed without profit to those who have expressed a prior interest in receiving the included information for research and educational purposes.